Bus 6011 from Incheon Airport will stop at Anguk Station in Seoul. Get off the bus here and walk backward for a short distance to reach Insadong main street. To take Bus 6011 at Incheon Airport, proceed to the 1st floor passenger terminal after arrival and wait for this bus at Bus Stop 5B or Bus Stop 11B at Terminal 1 or Terminal 2 (T2) 1 basement floor Number 31 . The bus ticket fare for this bus from Incheon to Insadong in Seoul city center is KRW10,000 only. There are plenty of spaces to store you baggages on the bus as well as at the compartment under the bus. 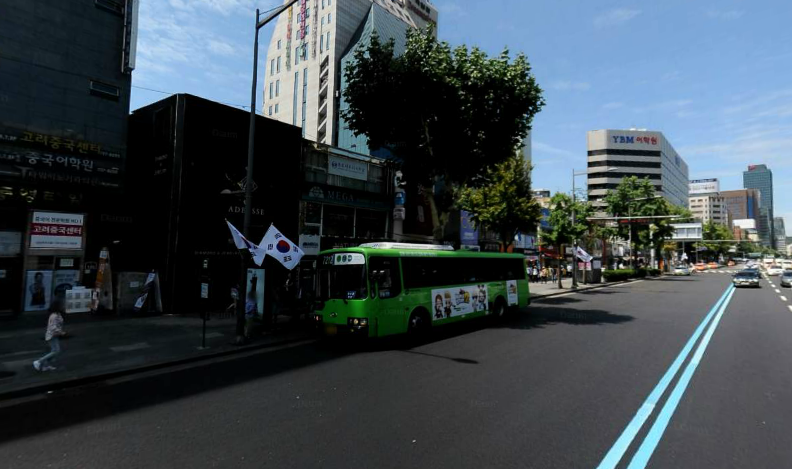 Bus 6011 to Insadong departs from Incheon Airport every 20 minutes to 30 minutes from 5.40am to 10.40pm every day. In other words, after the last bus departs at 10.40pm, you either have to catch a train to Seoul Station and then transfer to Anguk Station or take a taxi or wait for the first bus 6011 at 5.40am in the morning. Apart from stopping at Anguk Station for those who go to Insadong, bus 6011 also stops at World Cup Stadium (Mapo-gu Office), Seongsan Hall, Yonsei University, Ewha Womans University Back Gate, Gyeongbokgung Station, Changdeokgung Palace, Sungkyunkwan University (Hyehwa-dong), Hanseong University Station, Seongshin Women's University Station., Miari-gogae, Gireum New Town, Wolgok New Town (Mia Sageori), Changmun Women's High School, Dream Forest, Lotte Castle Lural Apartment, Induk Institute of Technology and Wolgye Daewoo Apartment bus stops. If you want to go from Incheon Airport to any one of the above places in Seoul city center, you can also take bus 6011. Option 2: Bus 6002 - Take bus 6002 at Incheon Airport. 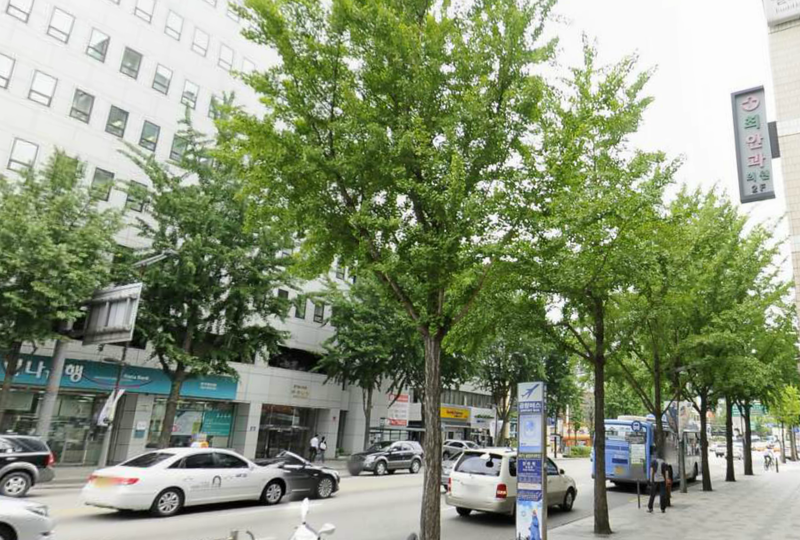 Get off the bus at Jongno 3-ga Station and walk in backward direction to Insadong. In order to take Bus 6002 to Insadong from Incheon Airport, you have to wait for the bus at Bus Stop 5B or Bus Stop 11B at Terminal 1, and for the new Terminal 2 (T2) at 1 basement floor Number 31 upon arrival at Incheon Airport. This bus to Seoul city center will depart from here every 15 minutes. The first bus 6002 departs from Incheon airport as early as 5.30am in the morning and continue to operate very 15 minutes until 11.30pm daily to cater for the needs of passengers who wants to go to Seoul city center. 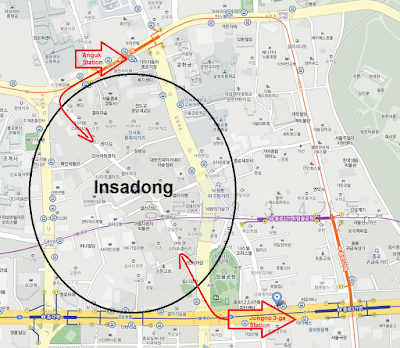 If you are going to Insadong, you can alight at Jongno 3-ga Station as shown above and walk in the backward direction briefly to get to Insadong area. Similar to Bus 6011, the bus ticket fare for Bus 6002 is also KRW10,000 one way. Apart from going to Insadong (Jongno 3-ga Station), you can also take bus 6002 if you want to go to Hapjeong Station, Hotel Seokyo (Kyungnam Wedding Hall), Hong-Dae University, Shinchon Station (Hyundai Departmental Store), Sinchon Ogeori, Ewha Womans' University Station, Ahyeon Station, Chungjeongno Station, Gwanghwamun Station (Kyunghee Palace), Jongno 1-ga (Jonggak station), Jongno 2-ga (YMCA hotel), Jongno 4-ga (Gwangjang Market), Jongno 6(yuk)-ga (Dongdaemun Market), Dongdaemun Station (Dongmyo), Shinseol-dong Station, Jegi Station, Cheongnangni Station, University of Seoul, Jeonnongdong Sageori, Sindab Station, Dongdaemun-gu Office and lastly Shinseol-dong Station located in Seoul city center. Given the large number destination covered by this bus, it is not surprising that you will always find passengers on this bus either heading from or to Incheon Airport. Which shuttle bus to take from Incheon Airport to Insadong? Both shuttle bus 6011 and shuttle bus 6012 will bring you from Incheon Airport to Insadong conveniently. 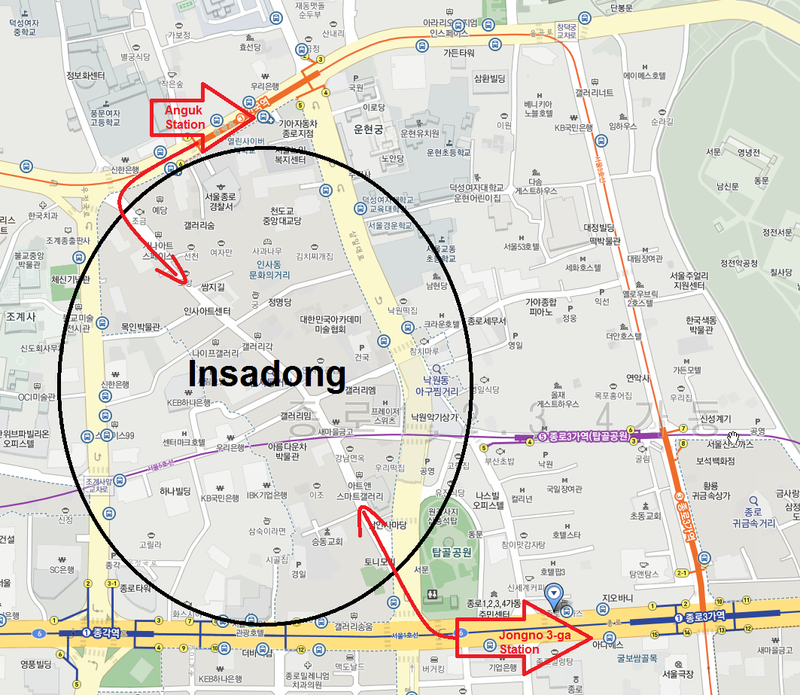 However, yo have to take note that they arrive at different ends of Insadong. For bus 6011, the arrival will be at the northern end of Insadong at Anguk Dong (Anguk Station). 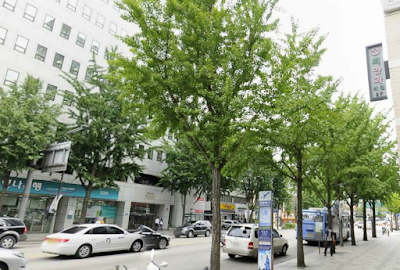 On the other hand, bus 6002 from Incheon Airport will bring you to the southern end of Insadong at Jongno 3-ga station. Actually these buses not only can take you from Incheon Airport to Insadong, but also other popular tourist spots in Seoul city center such as Gwanghwamun, Gwangjang Market, Dongdaemun Market, Gyeongbokgung Palace, Changdeokgung Palace, If you just want to take a quick tour at Insadong before returning to Incheon Airport, then you can choose to take either one of the bus to Insadong and take the other bus at the other end of Insadong to get back to Incheon Airport. This is very useful for travelers like me! Hope to see more posts like this one. I would really love to visit Incheon soon! Visit this page https://www.quora.com/Is-edubirdie-legit to know more about content writing. Thanks!